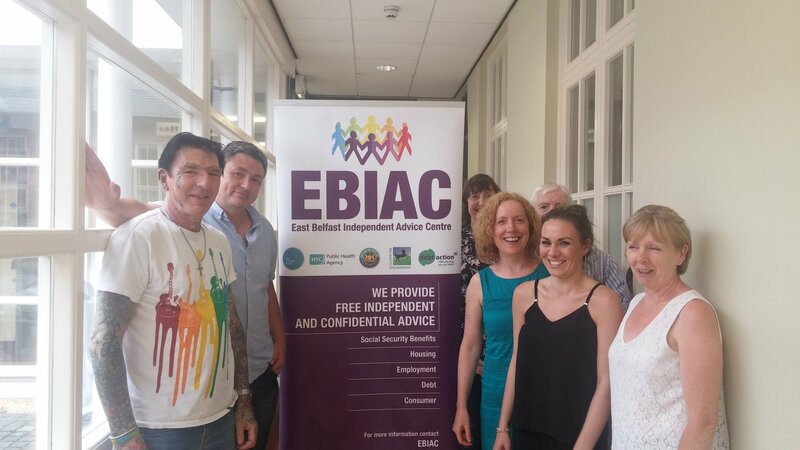 East Belfast Independent Advice Centre (EBIAC) is a busy community advice centre based in the East Belfast Network Centre on Templemore Avenue in East Belfast. They received an Awards for All Grant of £9761 to upgrade their computer system so they could provide a better service to the local community. EBIAC staff Phil Duke, Gerard Mogan, Wendy Hpwe , Mary McManus, Peter O’Hare, Carlie Martin, Cindy Gordon. We provide advice and practical assistance to people with Social Security, Housing, Employment and Debt issues. In order to provide people in the community with quick access to advice we provide drop in clinics, telephone advice, email advice, home visits and appointments. Providing quick access to our services is very important as often the people who use our services have very urgent problems. We are a team made up of staff and volunteers: we are very fortunate to have 11 dedicated and committed local people volunteering their time to help us provide our services. Our computer system was very old with some computers being very slow and others that simply did not work at all. In order to provide a quality advice service, we record all our cases on a secure online case recording system. Websites also make up part of the information system we use to provide advice. Much of our work is done online and our computer system was slowing down our work, causing frustration among the team and ultimately preventing us from spending more time providing advice. We were also facing the fact that the demand for our services was set to increase with the introduction of many changes to social security due to the implementation of the Welfare Reform Bill. The government’s digitalisation agenda was also creating an impetus for us to upgrade with online benefit claims being only a matter of time. Since we received our Awards for All grant we now have efficient and working computers for all the team and in our interview rooms. It is now taking less time to case record and research the best advice giving us more time to provide our services to people. It also means that we are now equipped to help the community with online benefit applications. We are very grateful to Big Lottery NI, Awards for All for our new computer system.